OLD Leamingtonians chalked up their ninth straight victory in Midlands Three West (South) with a 43-29 success at Ledbury. From the kick-off OLs took the game to Ledbury and forced the home side back into its own 22 metre area but solid defence prevented the visitors from capitalising on good forward play. However, the visitors’ persistence paid off after 12 minutes when a sweeping move led to the ball being played out to Liam Wellings, who forced his way through a number of tackles to score out wide. Henry Reynolds successfully kicked the extras. Three minutes later Ollie Sarginson forced his way through to touch down for a converted try to stretch the score to 14-0. A second try for Wellings after a fine interchange increased the OLs lead before Ledbury hit back with a converted try to reduce the deficit to 19-7. This only served to trigger a series of strong forward drives from OLs, with back row Hugh Melhuish storming through to touch down the first of his two tries on the day. The successful conversion gave OLs a 26-7 lead at the break as well as the valuable bonus point. After the interval Ledbury made the most of a dominant ten-minute spell to run in three tries, one of which was converted to reduce the OLs lead to just two points. However, OLs regained their composure and extended their lead through a Calum Semple try. It was not long before more OLs pressure resulted in Melhuish forcing his way through for his second try of the game. The final OLs try followed soon after when Ben Perkins touched down, with Reynolds kicking the extras. 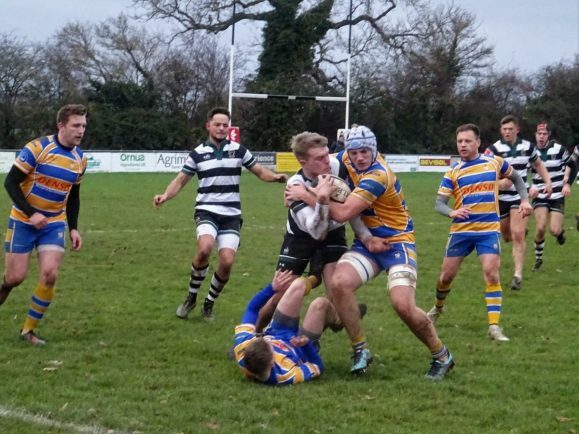 Ledbury had the final say with an unconverted try which earned the hosts a bonus point. League leaders OLs play host to Manor Park on Saturday (2.15pm).